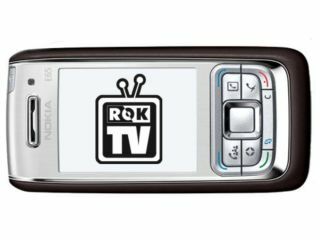 Nokia Eseries business phone users will be able to subscribe to ROK TV's live and on-demand mobile TV service directly from their phones. It'll be possible with a new package of business news channels lined up specially for the service. ROK TV's mobile TV offering is now available via the Download! Services option on selected Nokia Eseries phones. The ROK TV mobile TV service - which works on either 2.5G or 3G networks - will give Nokia Eseries users a choice of two channel packages. A 5-channel 'Strictly Business' package will cost £5 a month. It'll have an emphasis on business and finance, including channels such as Bloomberg , CNBC Europe , EuroNews in 9 languages and regional news channels. A 10-channel 'ROK All' package will cost £10 a month and include live business news channels plus additional sports news, music video and comedy channels. Both channel packages are free for Nokia users to trial for 2 weeks. However, subscribers are still subject to network data tariffs for using the streaming mobile TV service, so ROK is targeting the ROK TV service at customers who have a flat rate data package.